How will recent success help Utah recruitment? Utah has produced some home talent (e.g. Pita Taumoepenu) but many of the top recruits head elsewhere. Utah's success in 2015 has been legitimate, and if it continues, it may have a lasting impact on the program's recruiting prowess. According to ESPN.com, the Utes have only landed the top in-state recruit twice since 2006. Both players transferred away from the program. Even in 2008, when Utah was undefeated, the top recruits in the state went to USC and UCLA, respectively. This season, the two top recruits play for USC and other top recruits play for Ohio State, UCLA and Wisconsin. 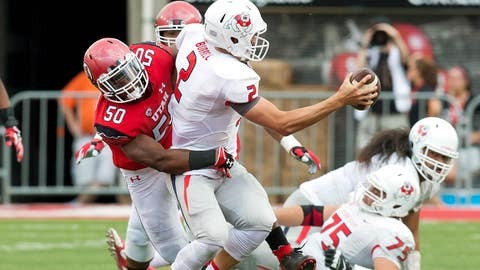 But will Utah's recent success help the Utes bring in some of the local talent? Perhaps the most exciting freshman for the Utes so far, Britain Covey, is originally from Utah. MORE NEWS: Want stories delivered to you? Sign up for our College Football newsletters.